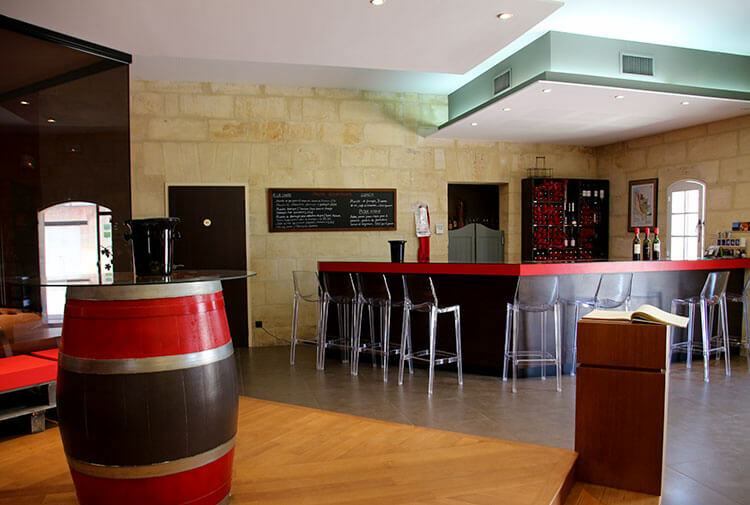 Château Ambe Tour Pourret is a small family-run wine estate not far outside the village of Saint-Émilion. 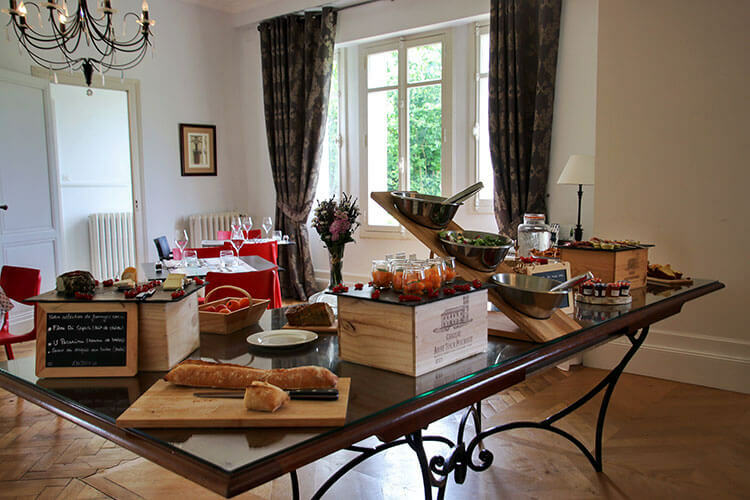 It’s one of the most fun châteaux to visit on the Right Bank with various oenotourism offerings like a monthly Sunday brunch, an on-site cooking class which you pair the château’s wines with, and cheese or chocolate pairings with the tasting. Just a short distance from the center of Saint-Émilion, Château Ambe Tour Pourret sits on the original road that connected Saint-Émilon to Coutras. Though the château didn’t yet exist at the time, Louis XIII used this road during the Hundred Years’ War when France was trying to regain the freedom of the Aquitaine from the British. The château was started in 1811, and the tower was added in 1845. The tower, emblematic of the estate, was used as a way to keep watch over the vineyard workers. The vines have been cultivated here since the 1800s. The château as we see it today has existed since 1925. Even though German soldiers occupied part of the little castle during WWII, it was mostly spared any damage from the war. The current owners, the Lannoye family, purchased Château Ambe Tour Pourret in 2007. They also own several other Bordeaux vineyards including Château Lanbersac in the Puisseguin Saint-Émilion satellite appellation and Château Moulin de Clotte in the Côtes de Castillon appellation. No matter whether you choose the cooking class, Sunday brunch or tasting with cheese or chocolate pairing, all of Château Ambe Tour Pourret’s oenotourism offerings begin with a visit of the estate. They achieved their organic certification in 2015 and the visit of the vines, vat room and barrel room walks through their production from vine to bottle. 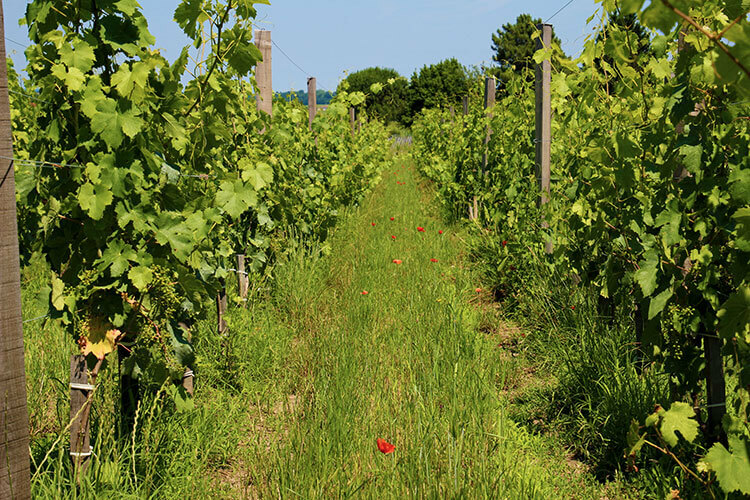 We start in the 5 hectares of vineyards, where the Lannoye family practices organic farming on the 40-year old vines. The château has officially been certified organic since 2015. 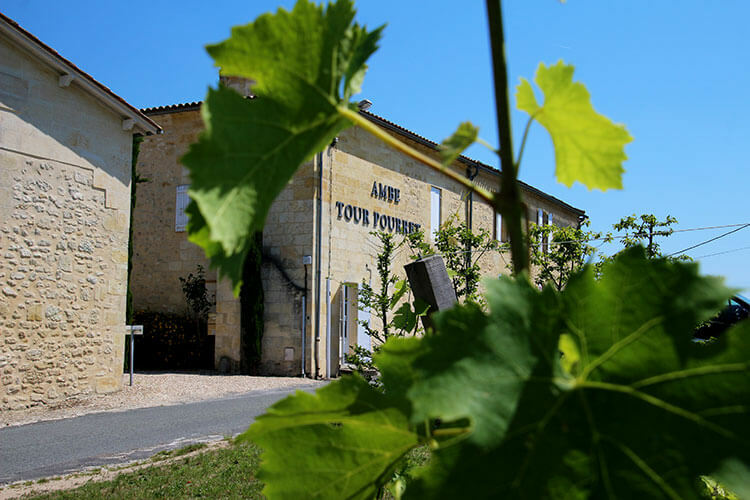 Not only does Château Ambe Tour Pourret have to adhere to the standards of producing an AOC Saint-Émilion Grand Cru, but also to the EU rules required for the organic certification. The organic rules dictate both the grapes themselves and the wine production. Situated on the bottom of the Saint-Émilion plateau, the terroir of the château is sand with clay which gives the wine very fine tannins and velvety qualities. Like many Bordeaux châteaux, the grapes are all hand-picked during the harvest. We make our way to the vat room where after the grapes are harvested, they are placed on a vibrating table before beginning their 15-day fermentation process. They use stainless steel tanks for the vinification, then the wine ages in French oak. For such a small winery, the barrel room is particularly beautiful with a glass wall that looks in to it from the tasting room. We always feel like it lends to the ambiance to feel like you’re surrounded by the barrels radiating their red fruit aromas while you taste. The visit ends with a selection of 3-5 of Château Ambe Tour Pourret’s wines, depending on which visit you’ve selected. Only the Château Ambe Tour Pourret Saint-Émilion Grand Cru is produced from this estate, and is a blend of 75% Merlot and 25% Cabernet Franc. The 2015 vintage was the first produced under their organic certification and the 2016 vintage is their best vintage to date. You can also taste other wines produced from the Lannoye family’s other estates, like the AOC Crémant de Bordeaux produced under their Celine label from the Entre-Deux-Mers. The tasting can also be paired with either cheese or chocolate, which we really recommend since most Bordeaux wine is truly at its best when paired with food. 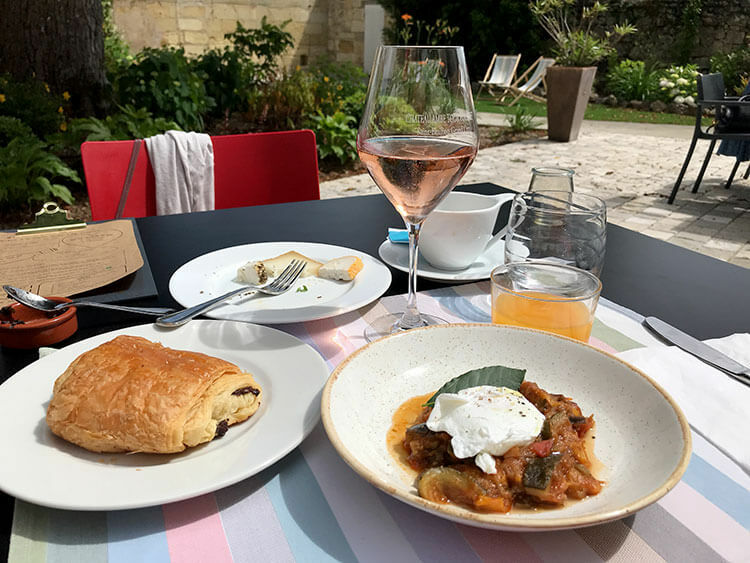 Even though brunch actually originated on this side of the pond (it was invented by British writer Guy Beringer in 1895 and took 30 years to actually catch on in the US), brunch was an unknown concept in France for the longest time. These days it’s fairly trendy to meet up with friends for le brunch on the weekend. And where better to brunch than at a château surrounded by vineyards. Château Ambe Tour Pourret hosts a themed brunch on the first Sunday of every month from April to October. There’s two seating’s: either at 11am or 1pm. You can even combine brunch with a guided visit of the estate and tasting, arriving an hour before your brunch reservation. The brunch theme changes each month. We attended on a Sunday with the Provençal theme. There’s a buffet that includes cheese, charcuterie, fresh seasonal fruit, salad, pastries and dessert. You also select from a menu and your eggs are cooked to order. With the Provençal themed brunch we had a choice of a poached egg over ratatouille, avocado toast topped with smoked salmon and a poached egg, or a Provençal breakfast platter. You also choose a side, which we had the choice of Provençal tomato gratin or roasted eggplant stuffed with tomato and cheese. Also included are a choice of juice and a hot beverage like cappuccino, tea or hot chocolate. 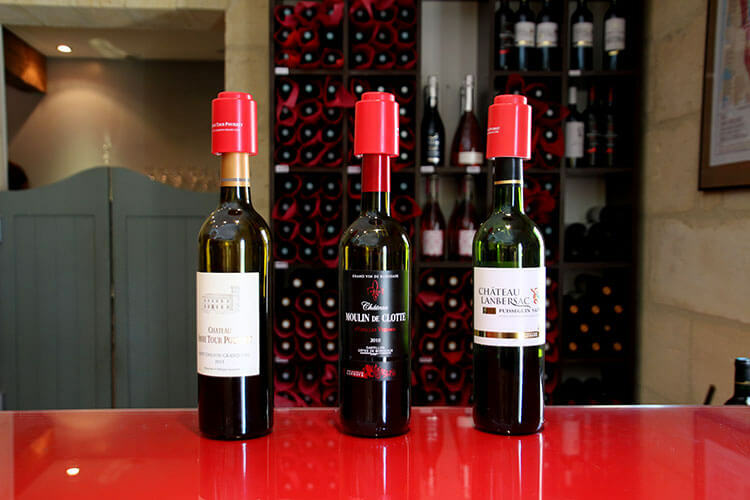 Wines of the château are available either by glass or bottle and are extra. You can choose to either sit inside the lovely château or take a table in the garden. 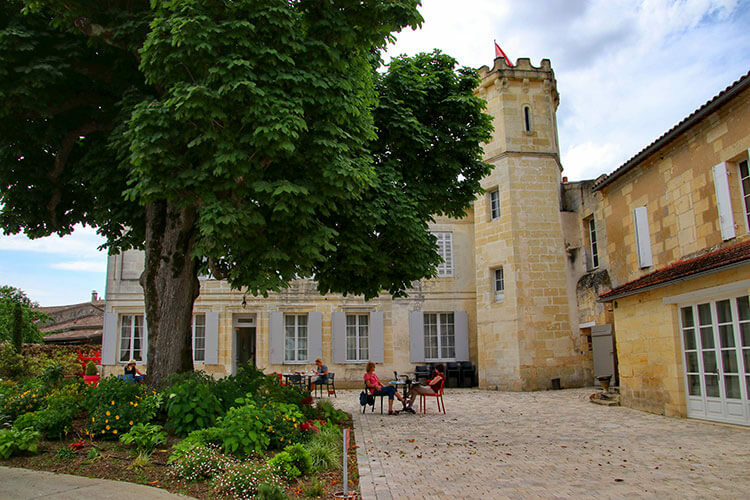 If the weather is good, we highly recommend enjoying the ambiance of the garden with Château Ambe Tour Pourret’s tower and 100-year old chestnut tree looming over you and the vines just beyond the tasting room. Château Ambe Tour Pourret is just on the outskirts of the village of Saint-Émilion. It’s a 1.5 kilometer walk or you can rent bicycles from the Saint-Émilion Tourism Office. Saint-Émilion is easily reached from Bordeaux Center by Oui SNCF train. Château Ambe Tour Pourret oenotourism activities can be booked online on Rue des Vignerons. Advance booking is required for visits, cooking classes and brunch. Visits and cooking classes are available year round, and brunch is available on the first Sunday of the month from April to October. This article contains affiliate links. When you book on Rue des Vignerons or Oui SNCF through our affiliate sites, we earn a small commission at no additional cost to you. I must admit that I recently fell for Castillon, the Côtes du Rhone region just next door to Saint-Emilion. I imagine the wines just across this border to be as good if not better. The idea of a relaxing brunch following a vineyard tour here is enchanting.